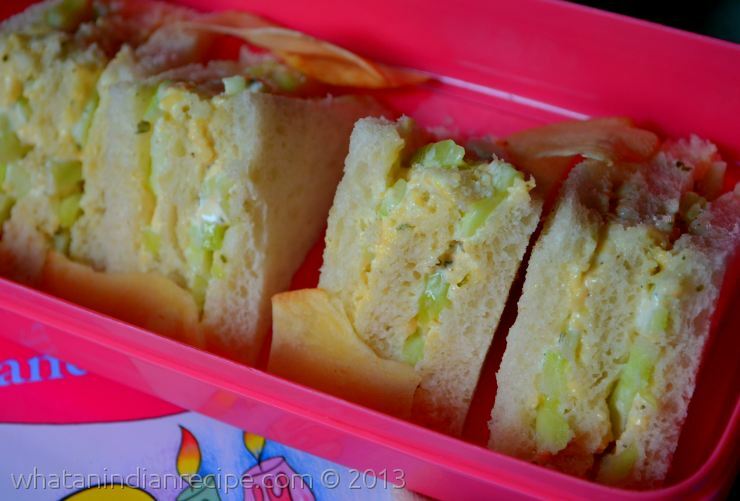 This sandwich makes a great and easy recipe for school kids’ lunch boxes. It makes a healthy & tasty tiffin for the kids too. In a bowl mix all the ingredients together except the bread slices. Cut the sides of the bread slices. Take one bread slice and spread the cucumber-mayonnaise mix on it evenly then place another slice on top of it, again spread the cucumber-mayonnaise mix on the other side of this bread slice and again place another bread slice on it(sandwiching 3 bread slices together). Now cut the three layered sandwich diagonally to form two triangles and then again cut each triangles again to make two more small triangles. Repeat the same procedure for the other bread slices. Your yummy mini sandwiches are ready . It is a great tiffin/lunch dish which is easy to prepare and will also be loved by the kids.